You probably already know that Gertrude Jekyll was a terribly clever analyst of how leaf and flower colour affect the eye, particularly in combination, but what struck me most in reading her work was her conviction that she would never posess one of the gardens she most desired: a golden garden. She wrote: “Suddenly entering the Gold garden, even on the dullest day, will be like coming into sunshine” (from Gertrude Jekyll’s Colour Schemes for the Flower Garden). In the lovely courtyard garden that Tracy McQue designed for me, I’m incorporating some of Gertrude’s ideas, attempting to ruthlessly limit flower colour to purple and yellow only. I was enchanted by Gertrude’s idea of a golden garden, and seeing as my late-flowering clematis Polish Spirit already clothes one of the enclosing walls in a complementary deep-purple carpet for four months of the year, the decision had already been half-made for me. The choice to limit colours was partly because of how we use this space. This tiny courtyard is the only place my husband and I come outside to eat lunch or have a coffee, and while I didn’t favour the green-only scheme that’s sometimes recommended for such an area, I didn’t want it to be too busy with distracting plants, either. Part of Tracy’s design was aimed at squaring off this irregularly formed courtyard to give it a more restful feel, and I don’t want to ruin that. The picture above (you can click it to see a larger version) shows one of the most startlingly wonderful narcissus, which you must go and buy as soon as possible: Sun Disc, with flowers no bigger than a 2 pound coin (with apologies to my American readers…about the size of a half-dollar). The scent is remarkable, the flowering time for me near Edinburgh is April-May, and the overall effect is more attractive than other baby narcissus like Hawera or JetFire, because the face of the plant is so round and there is no gaudy horn: the central cup sits flat. Also shown here are euphorbia characias (my first ever euphorbia…I swore I would not go another year without growing at least one kind), with some Washfield double hellebores going past in the background. Also planted in the tiny space you see here is chimonanthus praecox (January-February), crocus Ard Schenk (February), golden marjoram, and the fragrant Oriental Lily Cherbourg (August). Can you tell that scent is all-important to me? Flowers that don’t match the colour scheme are cut: the red-tipped tulips in this picture (tulip Clusiana Sheila) will be cut and brought into the house. When I came out of the house this morning to pick some baby spinach, I was greeted with a crowd of sunny yellow faces: the effect was exactly as Gertrude had anticipated. It felt like a blast of sunshine, although the sun almost never touches this corner of the courtyard. Have you tried to limit your colour palette in parts of the garden, for example areas where you eat? 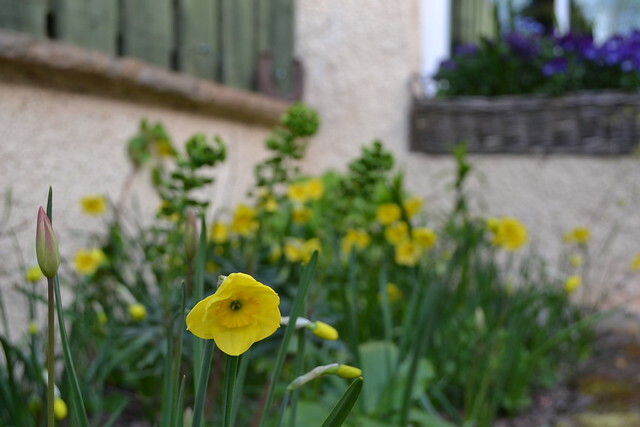 I do focus colour in different parts of the garden – and have so far found the yellow eyeful one of the hardest to achieve. In fact, I haven’t – is it because I get seduced into adding contrasts? (love scarlet and yellow..) Or yellow and blue ? (have a friend who deplores this as cliche, but massed alchemilla and blue geraniums do it for me..) Or your yellow and purple. Did anyone ever do just yellow and green? Hadspen did..! It was a wow. It was their only wow, really. Thanks Anne for your comment. I saw alchemilla mollis and a golden carex together recently in a Gardens Illustrated – that looked pleasing. I’d love to see a proper rendition of all-gold, and next year I’ll probably forego the purple pansies to be more purist myself. Look forward to hearing how it goes…. Thanks Eilidh! Slow going getting everything done, as we’re saving to get our roof repaired also! I absolutely need more euphorbias, I’ve loved all I’ve seen but not bought til now. I didn’t know your father was a great gardener too. My mum loved gardening but focused on food rather than ornamentals.